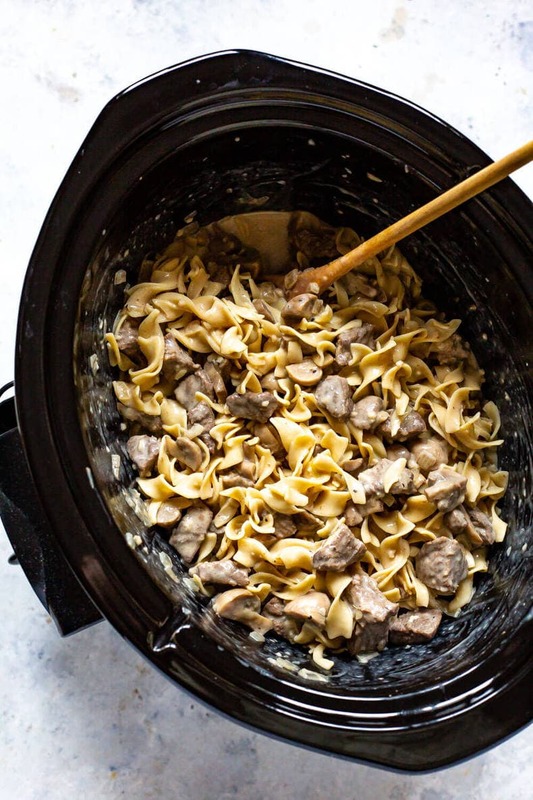 This Crock Pot Beef Stroganoff is a delicious, hearty comfort food idea for chilly nights – made in the slow cooker with sour cream and stewing beef, it's a delicious crock pot version of the classic stroganoff recipe! 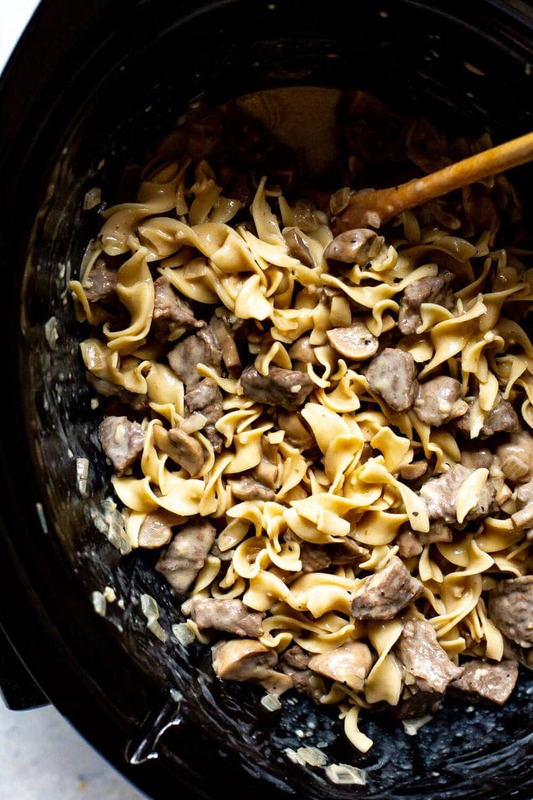 I may be the oldest 20-something ever but I LOVE me some good ole fashioned beef stroganoff – and this time I've made it SUPER easy for you in the crock pot! 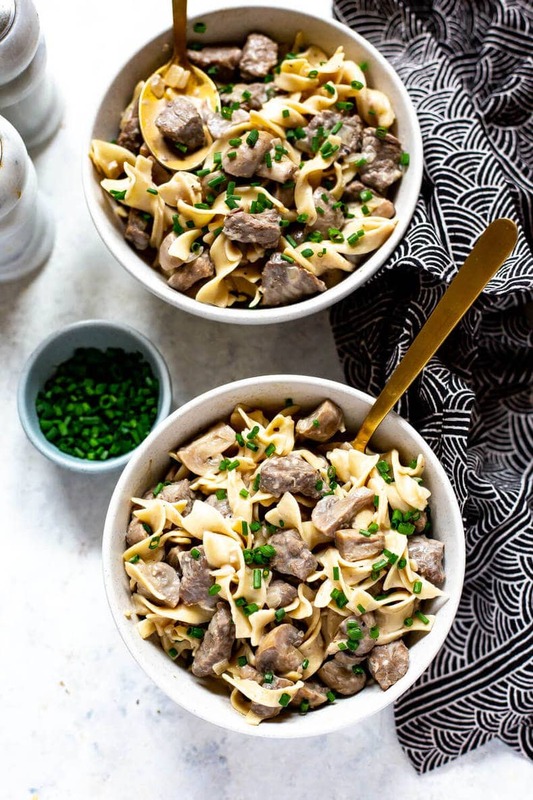 I'm so in love with beef stroganoff that I've even made an Instant Pot Beef Stroganoff on my other website, Eating Instantly, and I've also made a one-pot Healthy Beef Stroganoff that is more reminiscent of Hamburger Helper with extra veggies. I could eat this stuff all the time once the weather changes! 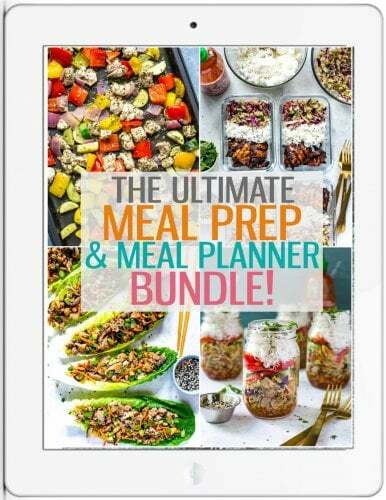 I guess one of the main things you should know about this recipe is that it's going to take a long time to cook, but the final effort is going to be SO worth it! 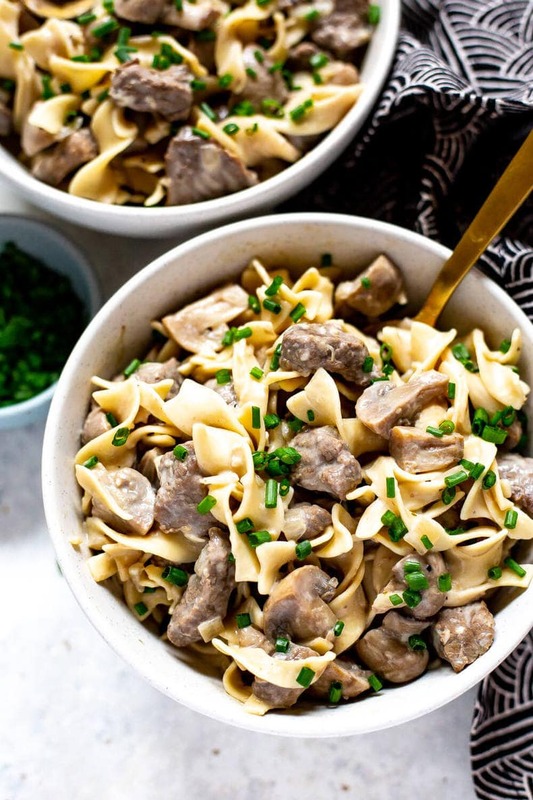 With tender chunks of beef that have been slow cooked to perfection, you'll only want to make Crock Pot Beef Stroganoff and never any other version! 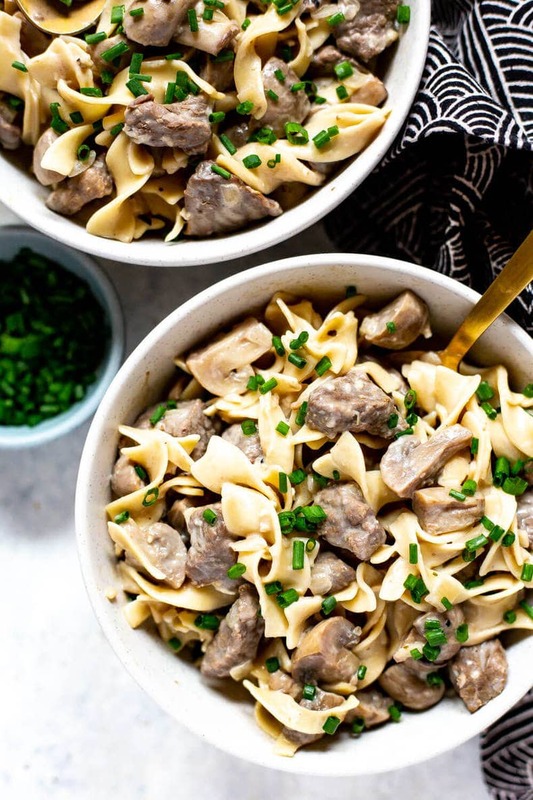 Believe it or not you only need a tiny bit of beef broth since the mushrooms release a ton of liquid, and this recipe doesn't call for any flour, cornstarch or thickening agents because you'll be undercooking the egg noodles a little bit in order for them to soak up and thicken the sauce! Instead of any heavy cream I'm using sour cream to still add some creaminess without all the extra calories and fat, and the rest of the seasonings are groceries you should already have on hand at home. 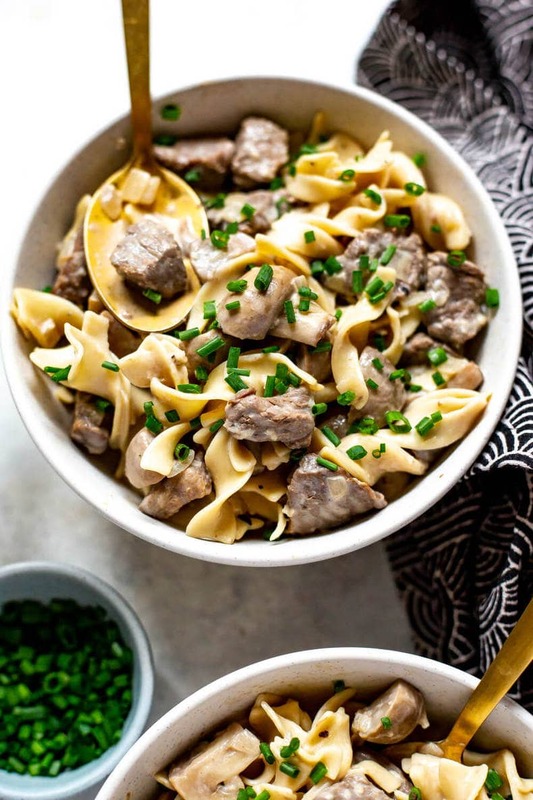 If you don't have Worcestershire or red wine you can also substitute 1-2 tbsp of Dijon mustard as that will give this slow cooker beef stroganoff the kick it needs – just be sure to include the onions, garlic and salt & pepper as those are the other key flavour agents in this recipe. 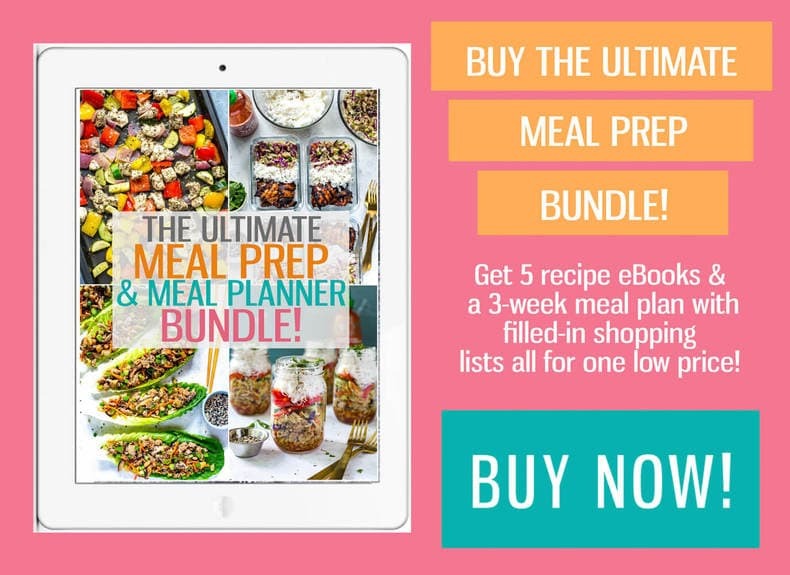 All you need to do is dump all your ingredients in your crock pot, cook for 8 hours, and remember to cook up your egg noodles about 5 minutes before everything is finished cooking. Make sure to stir in the sour cream until it's mixed in, and then gently toss with the egg noodles. You want the egg noodles to be a little bit underdone so that they still have a chance to soak up the extra sauce once everything has finished cooking, and you also don't want them to become too soggy. They cook in just a matter of 3-4 minutes (even though most packages state 5-7 minutes) so you can literally cook them at the last minutes right before you're about to serve everything. Garnish with some fresh herbs like chives or parsley, and you've got dinner on the table with virtually no effort on your part! 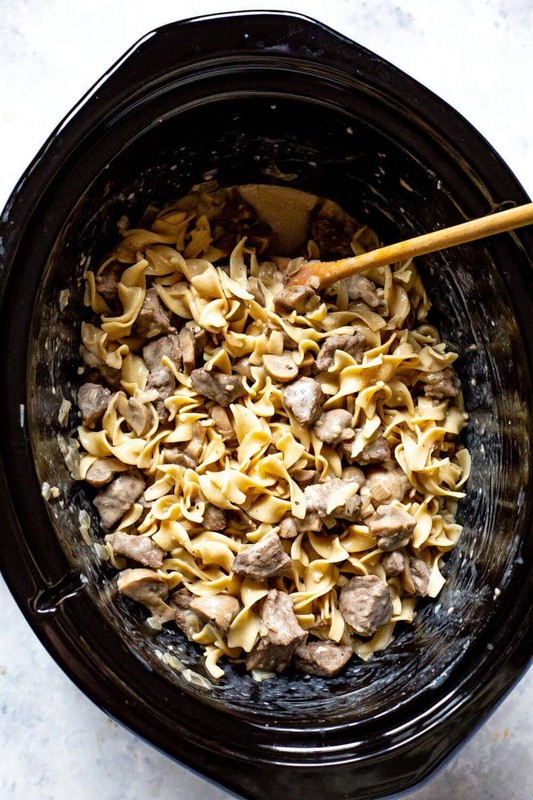 Will you be making this Crock Pot Beef Stroganoff? It's the most perfect comfort food for fall – besides this Slow Cooker Sausage & Kale Soup of course! 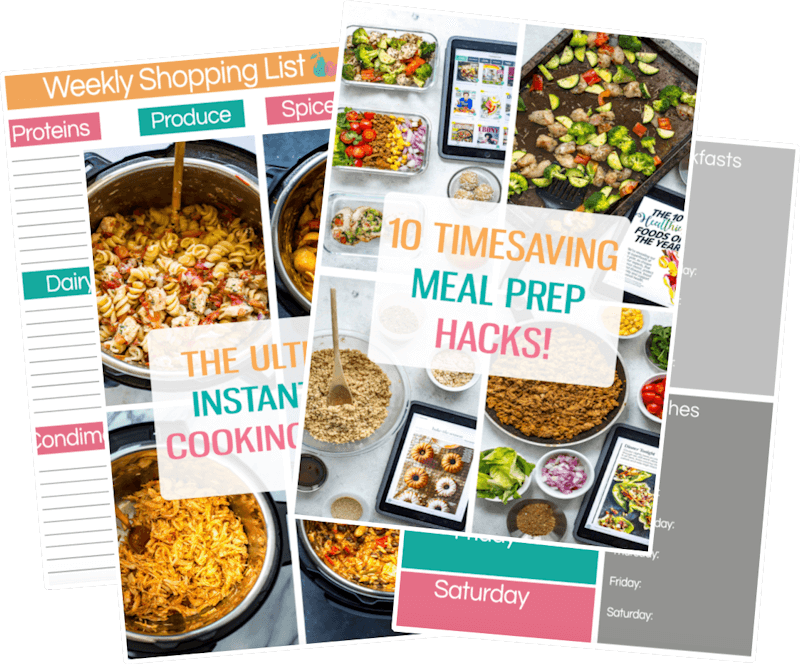 If you try any of my recipes be sure to let me know on Facebook or in the comments – I’d love to see what you come up with! 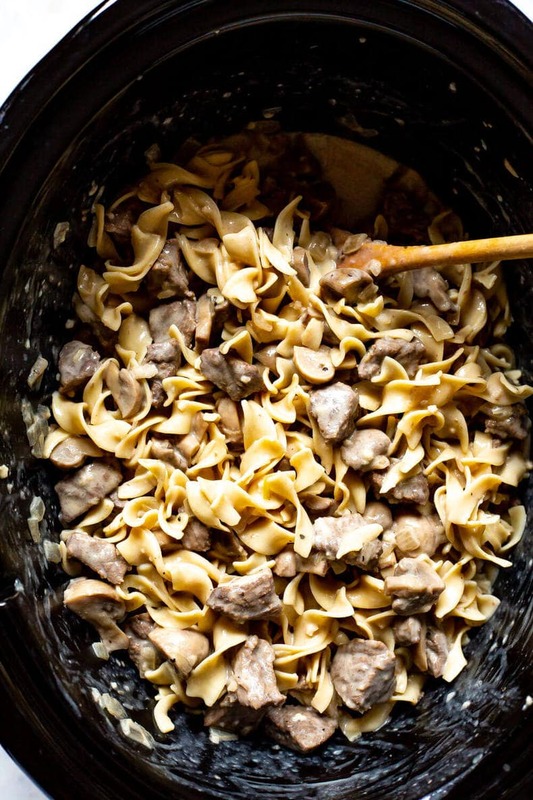 Grab some glass meal prep bowls if you plan on packing this Crock Pot Beef Stroganoff up for lunch! 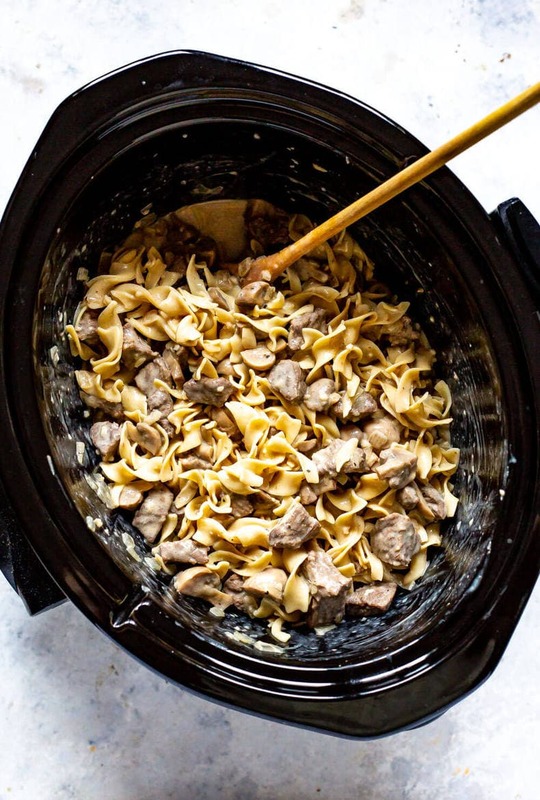 This Crock Pot Beef Stroganoff is a delicious, hearty comfort food idea for chilly nights - made in the slow cooker with sour cream and stewing beef, it's a delicious crock pot version of the classic stroganoff recipe! Add all ingredients except for sour cream and egg noodles to crock pot, stirring well. Cook on low for 8 hours. In the last 5 minutes of the beef mixture cooking, boil egg noodles for 4 minutes on the stove, then drain and set aside. You want the noodles to be slightly underdone so they soak up some of the sauce. Once cook time has finished, stir in sour cream and mix to combine well, then gently stir in hot egg noodles. Let the mixture sit with the lid on for 5 minutes (sauce will thicken up this way) then serve with chives/parsley overtop (optional) and enjoy!